How much moisture does your concrete transmit? This is an important question that needs to be addressed before you decide to apply epoxy or paint to your garage floor or basement. If you are unsure, then you need to perform a simple moisture vapor transmission (MVT) test at the surface of your concrete before a coating is applied. Your coating, as well as your hard work, may be destined to failure if you don’t. As hard and dense as concrete seems to be, it is actually very porous. Moisture beneath the slab will permeate to the surface of the concrete. Because coatings such as epoxy are impermeable and do not breathe, water vapor and moisture can’t pass through the coating. The build up of this moisture under the coating can cause it to peel or delaminate. Though paint will breathe, anything greater than light moisture vapor will cause paint to peel as well. For slabs that are below grade, hydrostatic pressure can develop if moisture transmission is blocked. This pressure can be strong enough to pop chunks of concrete along with it if a high performance epoxy or coating has been applied. Your concrete may already show signs of moisture issues and you don’t even realize it. If there are any areas of your garage floor or basement that always seem to have a white powdery residue that comes back after cleaning, then you most likely have efflorescence. Efflorescence is created when moisture travels through the concrete, condenses and evaporates, and then leaves a residue of calcium hydroxide (white powder). 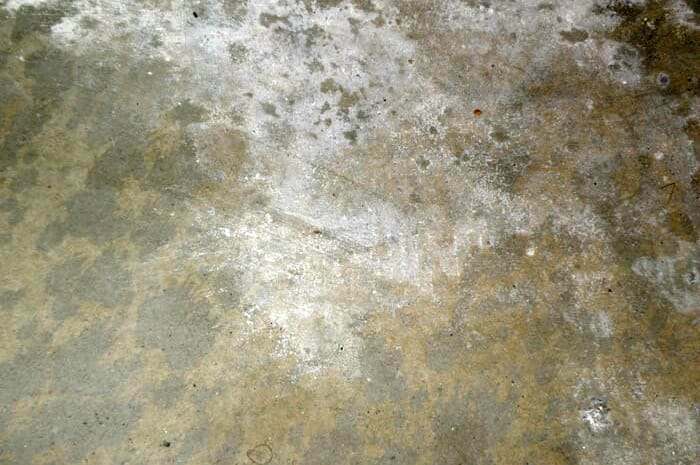 If you have an area of your concrete or garage floor that always seems damp, then this is a sign of moisture problems as well. This can sometimes be the caused by leaky pipes or drains under the slab or poor drainage from the perimeter of the slab. So, where does this moisture come from? In simplified terms, the porosity of concrete causes it to act like a sponge. If the ground that your slab was poured on is naturally damp due to climate or other factors such as water drainage or irrigation issues, then your slab will naturally draw in moisture from the ground. If the surrounding air at the surface of your slab is drier than what is underneath, then the moisture that your slab has collected will be transmitted to the surface of your floor as it tries to equalize. This reaction can be enhanced if your slab was poured below grade. In other words, lower than the surrounding earth. The easiest way to determine if you have moisture that transmits through your concrete is to test for it. A simple way is to perform the ASTM-D-4263 Plastic Sheet Test. 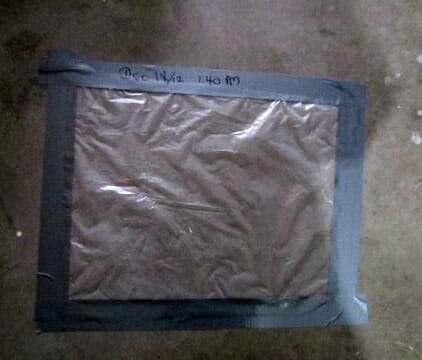 You can do this simply by cutting a 16”x16” piece of plastic sheeting and taping down the perimeter with duct tape to the surface of your garage floor. After letting it sit for 24 hours, peel it up and look for any condensation on the underside of the plastic or look for a dark spot on the surface of the concrete. Water on the underside of the plastic or a dark spot on the concrete is created from moisture. If none exists, then you should be fine. If you do have moisture then you will want to do a calcium chloride test to see how much moisture you have. Great information on how to perform a calcium chloride test as well as check your concrete’s PH level. A calcium chloride test is used to determine exactly how much moisture you have emitting from your concrete. This is done by placing a pre-weighed petri dish of calcium chloride on the slab an then covering it with a sealed plastic container. After a predetermined amount of time, you remove the petri dish and re-weigh it. Once you determine the weight difference, you generally can enter the results on the manufacture’s website or look it up in an included pamphlet. 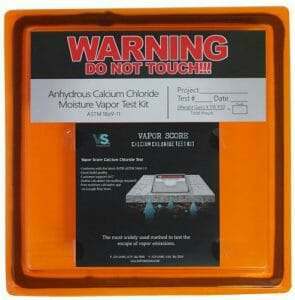 Calcium chloride moisture test kits can easily be purchased here from Amazon. You will also need to purchase an inexpensive digital gram scale if you do not already have one. You can find them here as well. As long as your results are less than 3 lbs of moisture flow per 1000 square feet per 24 hours, then you will be safe to apply most coatings. If your results are higher than that, then you will need to consider applying a moisture blocking sealer or moisture blocking epoxy primer before coating your garage floor. Of course there is always the alternative of deciding on a different garage flooring option. One important factor you need to be aware of is that a moisture test many times is only indicative of the current conditions. In other words, you may not have any moisture at all if you are testing during a period when there has been little rain in your area of the country. It is best to test during the wetter part of the year when possible moisture issues would be most prevalent. Of course, if your slab is above grade, doesn’t show any signs of moisture, and you live in a fairly arid part of the country, then doing a moisture test is most likely not necessary. Just remember, of all the things that need to be considered before you decide on an epoxy coating or paint for your garage, determining if you have a moisture issue is the first step. It’s easy and fairly quick to do and can save you from the disappointment and anguish of a failed floor coating. Hello Michael. If you did not have efflorescence before cleaning, then the water caused a reaction when it dissolved excess lime on the surface of the concrete and created calcium hydroxide. When it dried, the calcium hydroxide reacted with the carbon dioxide in the air and created your efflorescence. It wouldn’t be a moisture vapor problem. A solution of vinegar and water scrubbed on the concrete and then rinsed well with fresh water under high pressure will usually remove it. I have a garage floor that has been getting efflorescence during the rainy season, along with some collection of water in areas where the floor is cracked. Is there any way I can seal this up so that it stops happening. Hi Barry. The first thing you want to do is make sure water drains away from the foundation of your garage and not towards it. After that, you need to repair your cracks to prevent water from coming up through them. Larger cracks should use an epoxy patch repair with or without a sand slurry depending on the size, while the smaller ones can be repaired with a polyurethane or polyurea crack repair product. Once that is done, lightly acid etch the concrete to clean up the efflorescence and open up the pores of any dense areas of the concrete. The last step would be to apply a moisture blocking penetrating sealer to prevent any moisture from coming up through the remainder of your slab. Great advice. Know anyone who does this kind of work in the SF Bay area? Sorry Barry, we are not familiar with your area. We suggest contacting a couple reputable concrete contractors in your area and ask them who they can recommend that can tackle the job for you. Hi Karen. Yes, fixing a garage floor such as yours can be confusing. The dampness is most likely caused from humid air contacting the cooler slab and condensing at the surface. The pitting and spalling is generally caused from freeze thaw damage and road salts judging from your area of the country. What we recommend is cleaning the floor as Ardex recommends and then apply their product. Once it cures, prep the entire surface of your garage floor by grinding with a Diamabrush surface prep tool. You can usually find these are your local Home Depot or equipment rental. We talk more about grinding here. This will smooth out your patch work to make it look nice as well as prep it and the surrounding concrete for the sealer. Doing it that way will avoid having to use an acid etch. Hi! I have a very damp garage floor that also has some significant pits and spalls, like Karen’s does. It is set under the house, and is partially underground on one side. The floor is damp enough that there is even sometimes water gathered in the deeper pits. For kicks I tried the plastic test, too, and it revealed a darkened square. I really just want to do something to fix up the floor, which looks terrible currently. Is it possible to seal it well enough to allow me to epoxy it? If so, with what? Would it be better to seal it and then put down something like VCT tiles that stick on, but maybe don’t require quite as perfect of a chemical bond as epoxy does? If there is not a way to seal it well enough for epoxy or stick-on tiles, what are the best options? Is there a top coat cement product that will at least make the floor look uniform that can be applied to a damp slab? Or are the snap-together plastic tiles the best option? Is there something moderately affordable and DIY-able? And what do you recommend to fill in the pits and spalls given that it will likely be constantly damp? I know this is a ton of questions … thank you for any help or advice you can offer!! Hi Lee. Your biggest issue right now is stopping or at least slowing down the water intrusion. Start by making sure water drains away from the outside foundation and doesn’t sit up against it. Water that can pool outside will work its way down under the foundation and intensify the moisture problem. A lack of rain gutters can worsen a moisture problem for example. Once you do that, you will need to clean the concrete well and run fans to help the surface completely dry. Once it’s dry, multiple coats of a deep penetrating sealer will need to be applied to slow down and possibly stop the water intrusion. Epoxy or any other garage flooring option that adheres to the concrete should not be installed unless it passes the moisture test. We’re not saying it can’t be done, but when you have water that actually pools in the pitted areas, it can be very expensive to completely block it enough to apply epoxy. Your safest DIY option after slowing down the moisture problem are interlocking garage tiles. They will not mildew and they allow for evaporation of moisture if some still exists after applying the sealer. Unless the pitting of the floor is extremely bad, the interlocking tiles will install right over it without need of a repair. I just started doing prep work for laying epoxy on a garage floor before moving in. I found a section to one side of the garage that had a lot of white powder on it. When I washed it away with the pressure washer, I noticed one small oval area where the powder was had the smooth top surface of the concrete coming off. I also noticed that there were little spots of bubbling foam after I washed off that area. I had thought the powder was a spill of something from the previous owner but after reading this article, I’m thinking it was a long term build-up of calcium like in your picture from this article. Any thoughts on how I should address this? My next step was going to be muriatic acid before I found this problem. Should I go with an epoxy primer to block the moisture? I noticed your article on epoxy primers didn’t have any specific product recommendations. (Something available from Home Depot would be great since I need to move forward in a hurry; this is blocking my move-in) Would Seal-Krete Model Lock-Down Epoxy Bonding Floor Primer work for this purpose? Hi Collin. When you first suspect moisture you need to do a test first to determine if it really is a moisture problem or not. If it is, then you need to determine how much you have in order to figure out what you need to do. The spot you refer to may be a chemical spill that the water reactivated or it could be a moisture issue. Once that area fully dries, do the plastic sheet test in that spot to see what you get. Also, Seal-Krete Lock-Down is not an epoxy primer. It a latex acrylic concrete primer for acrylic paints and 1-Part epoxy paints. It is not epoxy. If you aren’t sure about the difference, then we suggest you read this article. Epoxy is a 2-Part resinous coating that needs to be mixed together first before application. Standard epoxy primers are not moisture barriers either. You would need a special moisture barrier epoxy for that. Neither of these types of products are going to be found in home improvement centers. This is an example here of a moisture blocking epoxy primer. I had already purchased H&C ShieldCrete from Sherwin Williams but have not opened or started anything so I could return. However, the expenditure of that ($80/box x 3) was close to the top end of what I am willing to put into this project, so all these complications are throwing me for a loop, not to mention delaying moving into the house! I have no idea how long the powder was there. This is in California so with the drought I wonder if a moisture test would be valid right now. I’ll put a sheet on today anyhow. With the highly porous surface of that slab, I was thinking of using a densifier on it. Would that help with moisture? Also, which order of densifier, epoxy fill of pits/hollows, and etching would you go with? Many times a moisture problem is not caused by rain, but by a drainage problem near or under the slab. Ground that is irrigated regularly next to the slab is an example. So is a leaky drain drain or water pipe that runs under it. If your moisture test result is negative then you shouldn’t have an issue. Prep the concrete, do any required repairs, and then apply your product. Densifiers will definitely slow down moisture but they are not a sealer. Deep penetrating sealers of a silane/siloxane mix work better. Either way, if you still want to apply a densifier or penetrating sealer; prep the concrete, apply the sealer or densifier, make any necessary repairs, then apply the epoxy. I looked at the staining patterns on the floor and concluded that water was entering the garage below the side door and then pooling in the area with the powder. I did put down two plastic sheets and have not seen any moisture under them. (however, it is 100+ degrees and no rain right now). So I’ve concluded there may not be moisture coming up from under so will just patch and the epoxy. Sorry to hear that Collin. Ask to talk to Scotty at Legacy Industrial about the AquaDyke primer. He will give you any tips you may need when applying it. Is this article linked in any of the categories? without a site-search function (that I can find) I have a hard time finding it again. Yes Collin, it’s under “Application” on the “Epoxy” page. We had deleted the search function on our site because no one was using it. You can also find a list of all our articles and pages under “Site Map” at the bottom of the page. Cooking oil spilled on my garage floor several years ago leaving behind a nice 12″ circle. What is the clean-up cure for this situation? So, slip resistant aggregate to the final coat would create a non-skid surface which would help me conquer a driveway with an 3% slope during inclement weather? Help! Hello Carl. You can learn how to remove oil stains from your garage floor here. As far as your driveway, you would need to apply an acrylic sealer in order to apply a slip resistant aggregate. A heavier aluminum oxide grit would be the way to go. It’s mixed in with sealer and then applied with a roller. We would recommend an MMA acrylic sealer similar to this one. I have 20 yr old garage below grade. It has some rust and discolorations. Its in the Northeast so subject to road salt. I want to seal it with an invisible system but leave myself the option of painting/epoxy coating at a later time to improve the appearance. The Ghostshield 8500 looks like the best option but can I paint/epoxy over it at a later date? Hi Craig. Yes you can. Just remember, concrete still needs to be prepped properly for an epoxy coating. Since it will have a sealer on it, you will need to prep the surface via grinding since acid etching will not work on a sealed floor. I went to the front of my garage door and notice a water stain and some water on the concrete flowing towards the garage. Hi Antonio. It’s not uncommon to get a little moisture at the front of the garage during or after a rain storm. When concrete cures, the surface almost always cures a little faster. This causes the surface to shrink a little quicker and the concrete will slightly curl up at the edges from the shrinkage. If water gets under the door, it will run down the slightly curled edge of the concrete and pool. Check the rubber seal on the underside of your garage door for a good fit. Sometimes these get dry and cracked and will let water pass through and requiring a new replacement. If you still suspect moisture coming up from under the slab, you can do a moisture test with a sheet of plastic as described in this article. I have a 2 car garage with a basement underneath it. The house was built in 2012. There’s a steel tray underneath the garage floor that you can see when looking up at the ceiling in the basement. There’s rust spots forming on the tray and I have had one side of the garage leak during last winter when there was snow on the cars and it would melt. I’ve been looking everywhere for some help. My neighbors house is designed the same way and he did the acid etching and epoxy and is still having issue. Thanks in advance! Hello Terry. Sealing the surface of the concrete, such as your neighbor did with epoxy, is one of at least two steps you need to take to help prevent moisture from above seeping through. A penetrating sealer is a much less expensive way to seal the surface as well. The second step is to properly seal all contraction joints at the surface and expansion joints around the perimeter of the floor. A flexible sealant such as SikaFlex should be used. We have an article about how to seal joints here. Water that beads up on the sealed surface will tend to find it’s way to these joints where it will sit and seep through. Epoxy coatings and sealers do not seal joints. If you tend to have heavy winters in your area, we also recommend using a containment mat during this time. They will prevent any moisture from getting on the surface to begin with and can be stored away when winter is over. Thanks for your help! I’m probably going to put a mat down and seal in the spring. In this article you mention “other options” as a means to make a garage floor nice, without using a sealer or epoxy – for those of us that have damp floors. Yet nothing on your link specifically mentions why it fits that bill. The soil in my area is naturally very damp and as such, my concrete absorbs quite a bit of water and sealing it before painting is not an option. Naturally something like the G-Floor mats seem like they’d work, but I don’t want to assume that’s what you meant. Hello Jordan. You bring up a good point. We’ll need to improve that link. Mats are not the best solution as they can develop mold and mildew underneath if you have moisture coming up through the slab. Your best bet for a garage floor with moisture issues that can’t be solved is interlocking floor tiles. They actually allow air flow under the tiles. This helps to dry the concrete during those wet periods and it will not let mold or mildew develop as a result. We recommend reading this article first to learn more about them. I have a garage 900 sq feet in northern wisconsin and have mildue on my cieling now and then, my ceiling is the only area where i see it, the ceiling has a cheep paint on it and is finished with a r40 above it, walls are insulated with vapor barrier ceiling hasnot. Has 2 windows and is very well sealed garage. I dont park my car in it just a couple boats, humidty level is usually above 70 pct what should i do to get this under control. I also hav a attic fan an no sign of a wet floor problem. Hello Rob. A well sealed garage space with humidity levels over 70% is a perfect recipe for mildew. Ventilation and fresh air is important to reduce the chance of mildew under those conditions. Do you have a window or two? If so, open them up some and run the attic fan to bring the fresh air. This will allow the air to circulate. If you don’t have windows, open the garage door for a few hours at a time to allow the air in to circulate. Another option is to run a dehumidifier. Here is a chart that recommends the size and type. I live in San Diego, California where it is generally very arid. I had a licensed contractor apply epoxy flooring in my garage. After a few weeks dark spots (like a sticky residue) started to appear in one section of the floor. Contacted contractor and he said it was moisture. I know he did not do a moisture test prior to the 3 step process. Even though he has given a 10 year warranty he won’t honor it. My question is without him doing a moisture test, and I wasn’t given the option of a vapor barrier, why should he not be responsible for the flooring? And now the air bubbles are drying out and the epoxy is chipping off. I need to have some help with how I should proceed. Thank you for your website and I hope you can give me the advice. It gas only been a year but problem started 9 months ago. Hello Debbie. We’re sorry to hear about your moisture problem and the frustration you are dealing with. The details really do lie in the contract. Many times the warranty is for material defects only. Does it state anywhere that they are not responsible for moisture problems? If not, you may want to start a claim with the BBB in San Diego and see how they can assist you. If the company you dealt with are a BBB member, then it will help in working out a resolution. We have a house in Florida that is approx. 100 feet from the intracoastal waterway and want to put in a tile floor. The MVER tests ranged between 5.4 and 7.3. What is the best way to seal the floor prior to installing the tile? Hello Pete. 5 lbs is about the upper limit that thinset can take when it comes to MVER’s so something does need to be done. We recommend giving Concrete Sealers USA a call. They have some deep penetrating silane and siloxane sealers that will reduce the MVER’s quite a bit. It’s important to ask if they will leave any residue at the surface where the thinset needs to adhere. We also recommend giving either Mapei or Laticrete customer service a call and talk to them as well about the thinset adhering properly with a deep penetrating sealer. It may require roughing up the concrete first. They do have moisture blocking epoxies that can be applied beforehand that is compatible with thinset as well. I am looking into having my garage floors done in a new construction home that was just completed last week. First garage coating company that came out did a moisture test with a meter and said it was high (showed it to me) and recommended the moisture barrier which added $1 per square foot to the cost. Second company I spoke to said moisture test isn’t necessary. Who do I believe?? I live in Phoenix, so it’s not like we get a lot of rain and I also wonder if the high moisture reading is due to it being new construction? Hello Marsha. When was the concrete poured? New concrete needs a minimum of 30 days to cure before applying a coating, sometimes more. The reason for this is that the concrete is releasing moisture during the cure process. We agree that moisture issues in Phoenix are not that common, but it can occur. Usually companies are curious as to why you may have high moisture to begin with. Did they ask the above question or poke around outside to find a possible cause to the moisture? Or did they just do a quick reading and recommend the up sale? We always recommend getting a minimum of three quotes from garage floor coating contractors when deciding on a coating. You should have a list of questions to ask. You can get more information here on how to choose one. Your article was right on point for me. I am in Perth, Western Australia and a few weeks ago I diamond grinded my garage floor to clean it so I can put down a new epoxy coating. I then washed the floor twice using a pressure cleaner (some water did pool on the concrete post washing). I noticed last night that there are patches of effervescence now present in the concrete – never happened before. It has been quite cold in Perth and I assume that the concrete has been opened up from the grinding and flooded with the water from the cleaning and hasn’t dried properly given the weather – causing the effervescence to appear. Do you think that is the likely cause of the effervescence or do you think I could have a moisture problem? Are you sure it’s not concrete dust that was left over after the water dried? If not, then more than likely it is efflorescence from the cleaning Andrew. Pressure washers on freshly ground concrete can drive the water deep into the slab and take some time to evaporate and dry out. It can carry the water soluble salts and minerals to the surface as it does this. To be sure, however, you should run a moisture test once you believe the concrete has dried out. Just tape a 16″ square sheet of plastic down to the concrete for 24 hours. Make sure it is completely sealed. If the underside of the plastic is dry and the concrete is not darker than the surrounding area, then you don’t have moisture. It is a white powdery residue so I am pretty certain it is not excess grinding dust. If the moisture test is all good, what do you recommend I clean the effervescence with and should I pressure wash the concrete again or just rinse it down with a normal hose? Because it’s so fresh Andrew, many times it can be scrubbed off with just water and a stiff brush. Just use the running water from a garden hose to get it wet first. This avoids driving water deep into the pores like the pressure wash did and recreating the problem. After scrubbing a section, rinse with the garden hose. If that doesn’t get all of it, then mix a solution of 1 gallon warm water to 1 cup of vinegar, scrub, then rinse. I Washed the concrete using a stiff broom and water from the garden hose and cleaned off the effervescence but it has since come back after a few days. The moisture test I did came back ok so I am thinking that the concrete is still drying from the pressure wash – which was 2 weeks ago now. Do you agree that this is the likely scenario? Maybe I need to let it dry it completely for a few more weeks? Yes, let it sit a while longer Andrew. When you clean it off again, mix a solution of vinegar and water in a bucket and mop the surface. Just enough that it’s damp but doesn’t puddle much. Scrub with a brush and then mop over it again. This uses a minimal amount of water and the surface should be ready to coat the next day. My concrete front porch is not level and water puddles up. I want to paint it, can I paint damp concrete? No, you can’t paint damp concrete Frank. You need to let it dry out completely or your paint will peel. Hi Shea, All of this information is very helpful. I have a definite moisture problem. My biggest concern is that I am actually planning to turn 1/2 of my garage into a bedroom. What type of floor do I need to put down after treating the concrete to keep any mold from forming under a carpeted floor? Your advise is very much appreciated. Hello Tammy. You state that you are going to treat the concrete and put down carpet. What do you mean by what type of floor you may need? Thanks for your response. I guess I am just asking what is your recommendation? What should we do to keep mold and mildew from forming under anything we would put down. It has been recommended to framed out the floor with 2 x 4’s then put plastic on top of them and plywood on top, leaving a space for air. Would this work and do we need to treat the concrete first. We also looked at a Dricore subfloor. What is your recommendation. What is the source of the moisture to begin with Tammy? Does water drain away from the garage? Is the slab below grade? You always want to address the moisture source first if you can. Once you do that, then you can decide on treatment (if needed). Most above grade slabs can be treated with a good penetrating sealer. Since you are going to put carpet over it, RadonSeal may be a good choice for you since it’s typically used as a basement floor sealer. Once you seal it, you should test it to see if the moisture has stopped. If it has then you are good to go. If not, then you can pursue more expensive options such as a Dricore subfloor. Hi, I have a concrete storage basement under my garage floor. the storage area is concrete walls and ceiling, runs the full width of the large, 2-car garage at the back side (opposite to the entrance area) and is about 1/3 the of the area of the garage. Problem is the walls and ceiling of the storage area are damp and chunks are falling off the ceiling along the rebar. this has been patched before by previous owners. the house is on a hill, exposed lower level. the wall with dampness shows much effervescence and is wall towards the entrance of the garage above. my home inspector spoke with foundation guy who said it’s from salt on my car leaching into concrete; I live in SE Wisconsin; solution seal the garage floor. Only have one car, but dampness shows in 3 large places along wall and ceiling the full width of lower garage storage area. any suggestions? Hi Catie. The chunks of concrete falling off the sealing may very well be from salt damage and/or freeze thaw damage due to the moisture and salts brought in from your car in the winter time. However, the efflorescence along the walls is from ground moisture due to the below grade build. You would need to clean the walls and the garage floor first and then apply a good penetrating sealer. A densifier with siliconate sealer would be a good choice for the garage floor, however, for the walls you may need a silane siloxane combination instead. We would also suggest the use of a containment mat during the winter to catch all the snow melt and road salts. Make sure that the drainage around the home is good as well. Water that tends to pool or sit will contribute to the moisture issues along the walls. We recommend contacting Concrete Sealers USA and talk with a representative about your issues. They are extremely knowledgeable with excellent customer service. They can recommend the best sealers to get the job done. Hi, I have a stem wall in my garage that has efflorescence on it and I was wondering if can apply some left over moisture blocking epoxy primer that I am using for my garage floor? Or would I be better off using a penetrating sealer? Thanks! If you have an actual moisture vapor barrier epoxy primer, then that would be your best bet, Gary. Just make sure to clean off the efflorescence first before you apply it. My garage floor was poured in two halves so I have a split right down the middle of the garage. I want to lay linoleum, because I have pets, and the concrete floor looks horrible with stains of different things such as soda, beer, animal urine etc. How do I remove the split? Right now one side is rising just enough to make the floor uneven. I know if I lay the linoleum over the split eventually there will be a dip in the floor that is pretty prominent. Can I fill the split with cement or floor leveler. Need lots of help. Hello Bernadette. When you say one side is rising, do you mean that it has gotten taller? If so, you really can’t do anything until you figure out what is going on. More than likely the other side is sinking. If you just meant that one side is slightly taller than the other after the job was done, then you can grind it down to match. A 4″ angle grinder with a concrete turbo cup wheel works well on the first few inches. If you need to level more than that you will need to rent an industrial floor grinder. As far as the gap goes, you can fill it with a self-leveling cement. It’s going to crack, but it won’t matter with the linoleum over it. I’ve had a lot of rain in my area this week. My bare concrete garage floor had some moisture on the edge of the garage by the stem wall. My first thought was i had water seeping through the stem wall. The rain has not let up but the moisture is gone. Could this have just been condensation? I’m going to try a plastic sheet test today. Any ideas? If you had condensation, Nathan, the entire would have been wet – not just one area. Yes, we recommend doing a moisture test. If it tests positive and you only get moisture during the rainy season, there are good moisture vapor barrier epoxy primers that you can put down first. Hi, Shea, can you suggest one effective way to get moisture from a garage park? Because my dad garage is smelling mustiness due to too high moisture content. I will be glad to hear you! Cheers…..Good info on your concrete moisture test! Hello Mark. The first thing we would recommend is to treat the concrete surface with a densifier. Densifiers work to slow down and even stop moisture migration through the slab. This moisture migration is what can cause the musty smells. Second, we would recommend making sure all water drains away from the foundation and not towards it. Standing water against the foundation will contribute to moisture vapor migration. South wall of the garage is below grade, west is level with yard, north is connected with the house, east is approach. Along the south, west and part of north have puddles where the wall meets floor. I painted dry lock around but it still puddles. Downspouts have extensions. What else can I do. Smells mildew too. Live in Midwest. Hi Janice. We need a bit more information. Which DryLoc product did you use and where did you paint it? Was it the walls, floor, or both? Also, is the puddling coming from the floor or seeping from the walls onto the floor?